So I figure it’s just another day ripping down London for us Scavs, but I’m dead wrong cos this is the shift everything goes ballistic. First up, our crusher goes kaput, and that’s a proper hassle cos we’ve got to de-clog the filters, which is the worst job, and we don’t get a bean for it cos we ain’t doing real scavving. And guess who’s buried in the intakes up to their elbows in concrete powder with a glorified bog brush? Yep, when you’re fifteen and a girl, you get all the plum mobs like that cos there ain’t no one else on the team can fit in the damn intakes. For Cass and Wilbur, the life of a Scav is all they have ever known – ransacking what’s left of London for a lost relic that no one, not even their new masters, has ever seen. But when two strangers from another time arrive, scavving will never be the same again. Buried beneath the rubble is something waiting to be found – with the power to begin and end life on Earth. They have six days to find it. Philip Webb has created a real sci-fi page turner with his novel Six Days. The two central characters are teenagers Cass and her brother Wilbur; better known as Scavs. This is a futuristic London that has been destroyed by frequent wars with the Russians among others. The Scavs, whose job it is to clean up the city, are controlled by the Vlads. From the very start of the book, we learn that Cass and Wilbur are secretly searching for a lost artifact that no one has ever seen before. Wilbur reads comic strips about Captain Jackson and his treasure seeking adventures. Does the key to finding the lost relic lie in the pages of these magazines? When Wilbur gets into trouble very early in the book, we are introduced to two new characters, Peyto and Erin. From the outset you know that they are not like other people and that there is something different about them. Can Cass and Wilbur trust them to help find the lost relic? Webb has created a London so unlike the one that we know today. The monuments still survive but have been abandoned and damaged by bio-chemical warfare and fighting. It took me a while to become comfortable with the book but that is primarily because I don’t, as a rule, read science fiction. However the characters are well written and you can picture the scenes that he sets. It is a page-turner as you become involved in the search for the artifact – what is it and where is it? Can they find it in just six days? 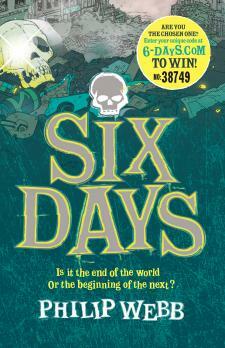 Six Days will definitely appeal to teenage boys who like adventure and sci-fi books. Totally agree with your review Viv. Absolutely loved Six Days! A great review. Its just that if your opening paragraph is anything to go by I'm just not too sure that I like the authors style of writing. I've read the book and it is actually really good by my standards, considering I have read most of the books I am allowed to read in my school library. To be honest I find the review quite sexist considering I am a girl and have read such books as Artemis Fowl, Time Riders and the Percy Jackson series. I'm not trying to be rude, but just take into consideration that girls read Science Fiction and Fantasy too!